Wavewalk’s motto Launch, Go, Fish and Beach Anywhere is a reality for many Wavewalk owners. However, the S4 being heavier than the W500 and W700, we thought it would be nice to have a wheel cart for it, for when we have the 59 lbs 6 HP outboard motor attached to it, and we want to launch and beach in difficult spots, namely beaches that require carrying the boat over asphalt or on difficult terrain, especially steep and rocky slopes. 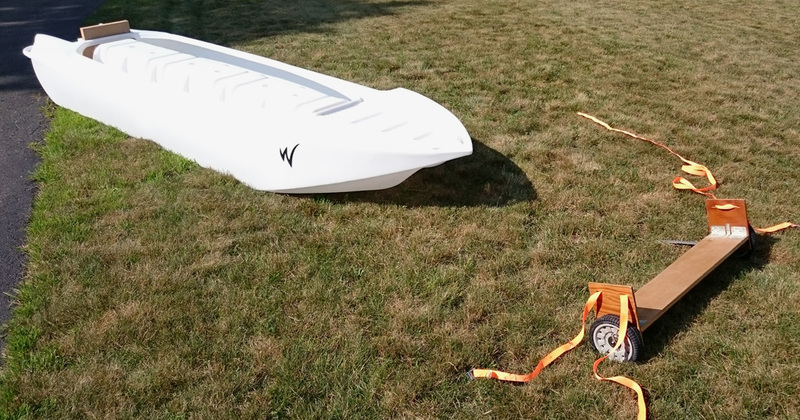 The heavier the fishing, diving or camping gear carried on board the S4 skiff kayak, the more justified is the use of a wheel cart to carry it. 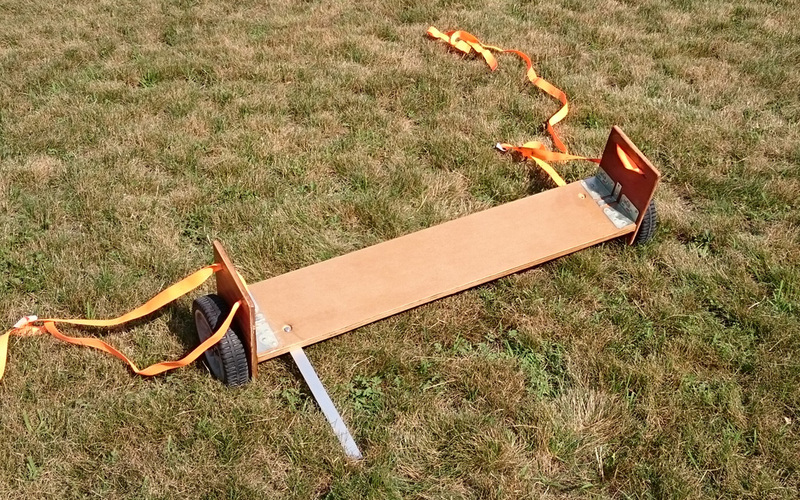 We outfitted the wheel cart with a folding leg that assures that the cart will be in the right angle to receive the boat. Loading the boat is done simply by pulling it onto the wheel cart. The user can decide where they prefer to have the wheel cart located relatively to the boat. A boat with a heavy motor attached to it would require the wheel cart to be located further towards the stern. It’s possible to upload the boat on this wheel cart from the bow or from the stern, depending on circumstances. Uploading from the stern makes it easier to place the close to the stern, which puts the boat in a good position for mounting the motor on it, as well as for carrying it with the motor attached to it. When stored on board, this wheel cart protrudes into the front part of the cockpit, and this could restrict the space available for a second passenger. In such case, this wheel cart can be attached on top of the front deck, and stored under it if one of the passengers wants to stand on the deck and use it as a casting platform. The 38″ long and 6″ wide horizontal main board is made from 3/4″ plywood, and so is the narrow reinforcement beam under it. All wooden parts are coated with urethane. We covered with Goop all the screws in the L brackets that could come in contact with the underside of the hulls. The vertical side boards are made from 1/2″ plywood. The wheels are 7″ in diameter. 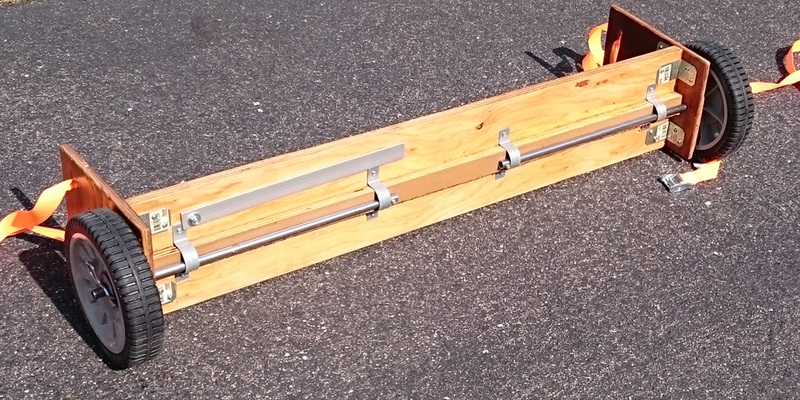 The axles are made from a standard 3 ft long 1/2″ diameter steel tube cut in two. 1. Front lower corners cut away to enable better performance over rugged terrain, such as rocks, roots, etc. 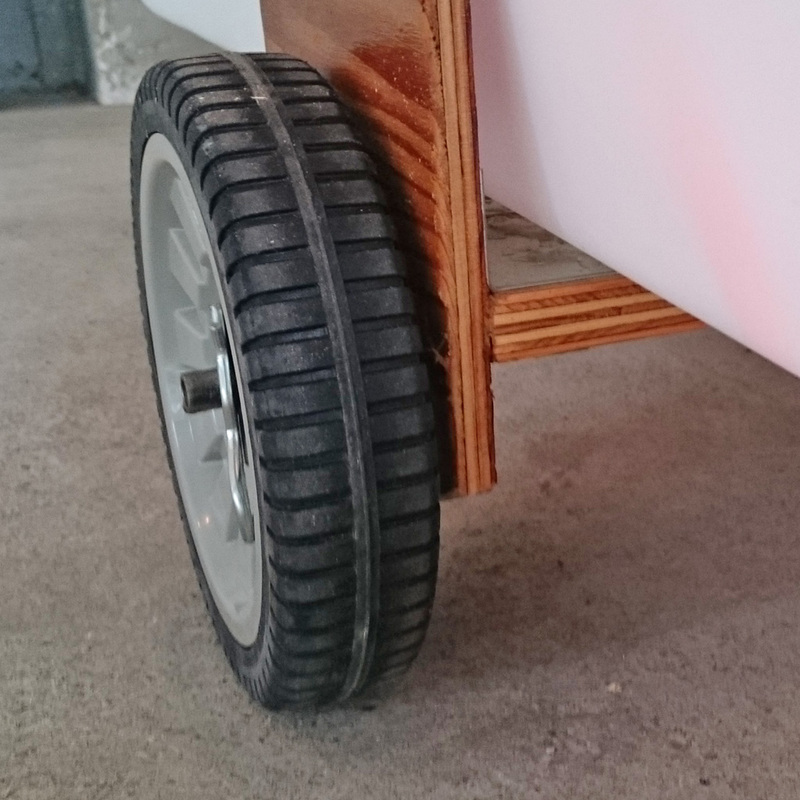 Making such a wheel cart is not an easy project. I like it. Simple and compact. In an “Oops!” moment I noticed that I had forgotten to round the lower front corners, which were a bit too low and too forward. This could have created problems when going on a rugged terrain, as the corners could have bumped against rocks, roots, etc. Many of the kayak and canoe launch ramps and access areas have a goodly trek to traverse before actually reaching the water. This is a handy tool to ease the S4 captain’s burden and reduce wear on the boat. DIY = Done it, Yoav. The swing-out stand is a very nice addition. I hope I’ll be able to use this thing soon. PS — That’s fifty seven, not a typo. Finally, we tested this wheel cart yesterday on the coast. 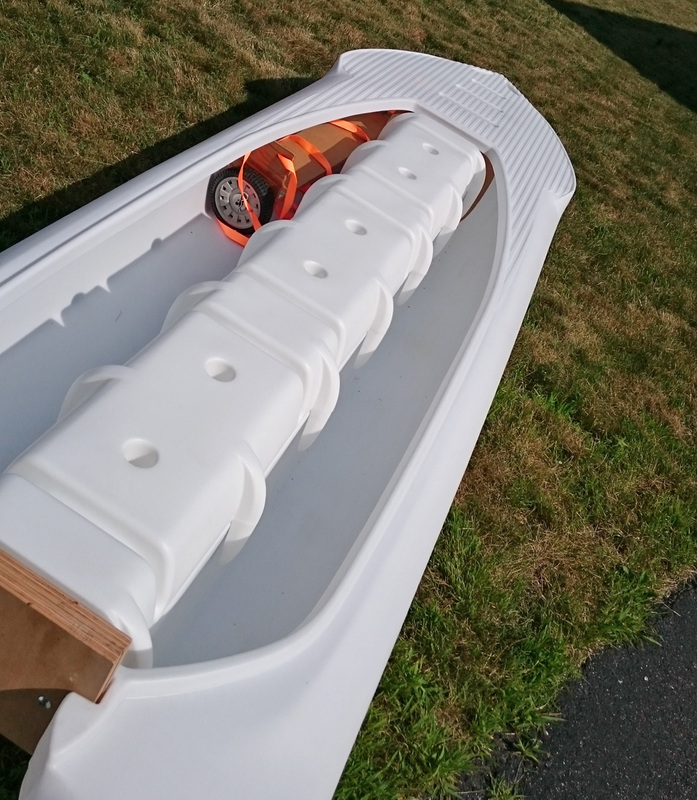 It was a pleasure to use on the road, in parking lots, and at the boat ramp, and it fit inside the boat without problems, even with two people on board. However, it was totally useless on rocky terrain and on sand, pretty much as expected. Luckily, dragging the S4 on such difficult terrain proved to be easier than expected, even with the 60 lbs 6 HP motor mounted on it. I think the reason for this is that the S4 has wider hulls than the W700, so it doesn’t sink as much in the sand.